With the goal of creating the largest commercial net-zero energy building in the country, the NREL Research Support Facility (RSF) is meant to serve as a blueprint for a net-zero energy future and influence others in the building industry to pursue ultra-energy efficiency and net-zero energy performance. The design maximizes passive architectural strategies that take advantage of the climate and drive energy use reduction. The design maximizes passive architectural strategies that take advantage of the climate and drive energy use reduction. Design strategies dramatically reduce the energy use first; then an extremely efficient lighting system, radiant cooling and heating system, and an underfloor air ventilation system further improve the energy performance of the building. Building orientation and geometry minimizes east and west glazing. North and south glazing is optimally sized and shaded to provide daylighting while minimizing unwanted heat loss and gain. Building floor plate is narrow (60′ wide) enabling daylighting and natural ventilation for all occupants. Window to wall ratio for north and south walls is 25% and the windows are organized into daylighting and view sections. Massive concrete structure in the RSF crawl space stores thermal energy and provides additional capacity for passive heating. All the workstations are day lit. No employee is seated at more than 30 feet from a window. The building form evolved in response to daylighting penetrating deep in the building. 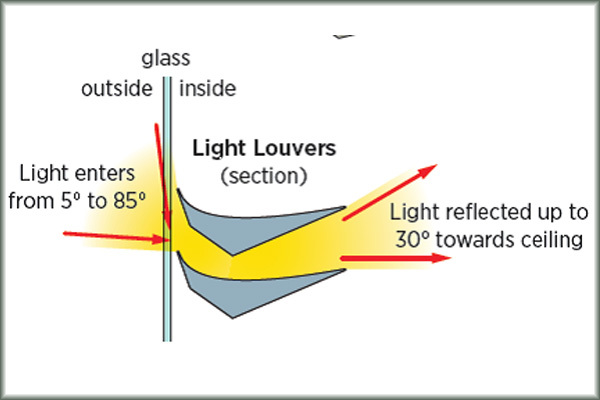 Daylighting exceeds 30 foot candles during sunny sky conditions, providing all required lighting. All the glazing in the vision section of fenetrations on the north and south sides of the building is triple glazed, and thermally broken window frames increase the energy efficiency of the units. To reduce glare on the south facade, overhangs shade the lower vision glass. 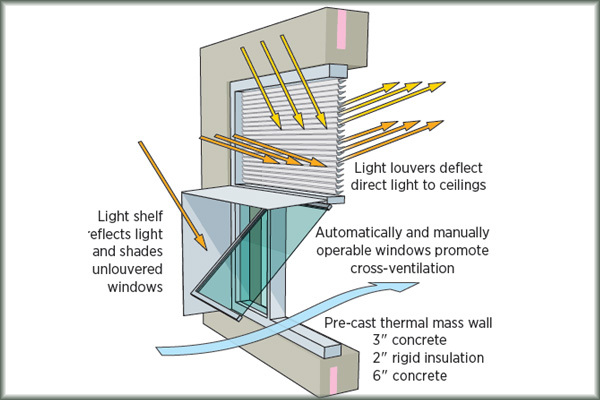 Window shading is designed keeping in mind orientation of the fenestration and position of openings. Occupants can open some windows to bring in fresh air and cool the building naturally. Precast concrete insulated panels: A thermally massive exterior wall assembly using an insulated precast concrete panel system provides significant thermal mass to moderate the building’s internal temperature. The building includes a large thermal labyrinth under the two main office wings. 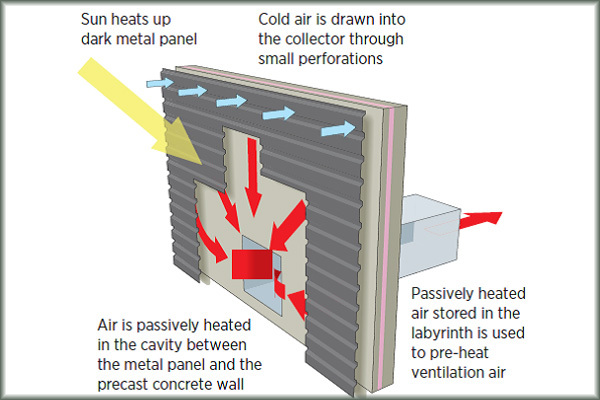 The labyrinth can store heat from the transpired solar collectors on the south facade of the building. It also serves as a thermal sink for rejected heat from the building’s data centre, dramatically lowering the cooling load of the data centre year-round. The labyrinth can warm outside air by 5–10°F. and acts as a thermal battery. Approximately 42 miles of radiant piping runs through all floors of the building, using water as the cooling and heating medium in the majority of workspaces instead of forced air. Water in the radiant ceiling slabs is heated by NREL’s Renewable Fuels Heating Plant (central woodchip boiler) and cooled by high-efficiency chillers that provide chilled water to the rest of the NREL campus. A demand-controlled dedicated outside air system (DOAS) and natural ventilation system is installed in the RSF. When the ambient temperature is conducive, windows are opened to allow natural ventilation. When conditions do not permit natural ventilation, such as on the hottest and coldest days, the DOAS provides mechanical ventilation. Supply air is distributed through an underfloor air distribution system with swirl diffusers. 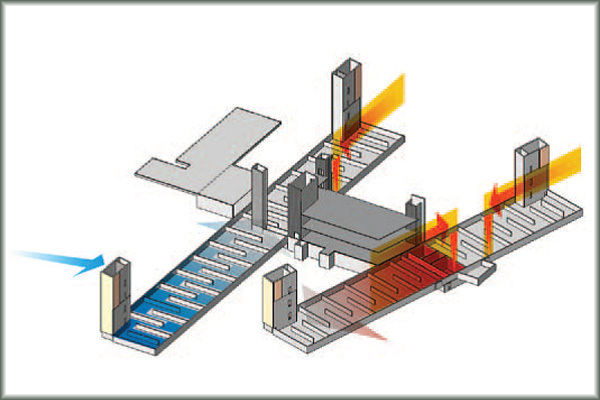 Evaporative cooling and energy recovery systems further reduce energy use for space conditioning. A fully contained hot and cold aisle data centre configuration allows for effective air-side economizer cooling with evaporative boost when needed while capturing waste heat for use in the building. Plug loads are mini­mized with extensive use of laptops and high-efficiency office equipment. When daylighting is insufficient, 25W T8 lamps provide a minimum of 30 foot candles at each workstation. Manual switches, photo sensors, and occupancy sensors ensure electric lighting is switched on only when daylighting is not adequate. LED task lights, each of which consumes only 3 watts, provide localized electric lighting. Vacancy sensors turn the lights off if the occupants do not. 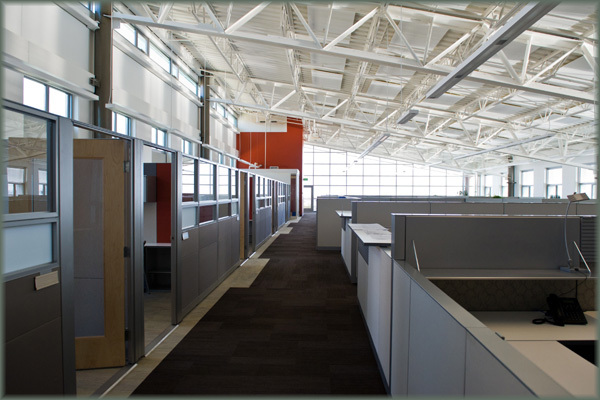 Interior acoustical treatments, furniture, and paints were selected to maximize daylighting in the building. Lighting controls strategy for the RSF is to encourage occupants to turn their lights on if daylighting is insufficient and to turn them off when they leave the space. Roof of the building tilts gently to the south to enhance energy generation from a roof-mounted photovoltaic (PV) system. A south-facing 10-degree slope and a standing seam metal roof offers an optimal mounting surface for the rooftop PV system. Total installed capacity of the rooftop array is 450 kW. PV panels used at RSF are more than 17% efficient. Rooftop array alone does not offset the RSF’s energy needs, so several adjacent parking structures have been covered with PV panels. Combined installed capacity of rooftop and parking structure arrays is around 1.6 MW which is sufficient to offset all of RSF’s annual energy needs. 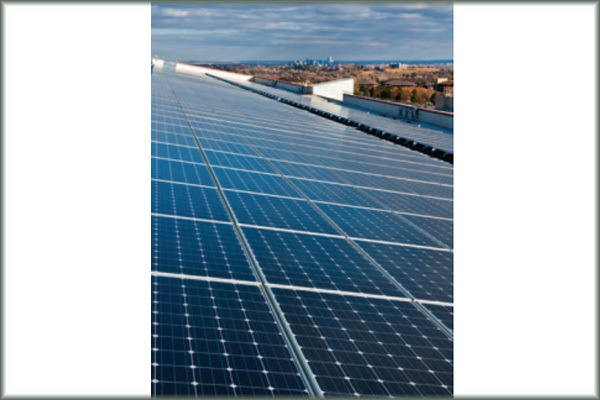 Rooftop PV plant were installed through a Power Purchase Agreement, and PV panels in the parking areas were purchased through the 2009 American Recovery and Reinvestment Act funding. Energy-efficient elevators are installed at the facility. Energy-efficient fluorescent lighting used in elevators. Elevator lighting is turned off whenever the elevators are unoccupied. 6-watt LED task lights reduce lighting loads further. Instead of standard phones, voice-over-internet protocol phones, which consume 2 watts each, are used. Use of individual copiers, printers, and fax machines has been minimized. Use of group copiers, printers, and fax machines is encouraged. All-in-one machines (combined copier, printer, and fax) have been installed to reduce equipment load. Laptops are encouraged over desktops. Instead of 300 watt personnel computers, 30 watts laptops are used. About 90% of the staff uses laptops.